Way back in 2011, I cycled out of the city of Utrecht with my partner, who was riding a bike for the first time in well over a decade. The trip was almost entirely painless, with no interactions with motor traffic, except on short stretches. One of these stretches was Prins Hendriklaan, to the east of the city, where she felt the most nervous. At that time, that street looked like this. Wide (by British standards) cycle lanes, combined with humps and no centre line markings. This is not an especially busy road for motor traffic, but it is one of the main routes in and out of the city for people cycling, with over 14,000 people cycling along here every day. For me – used to British conditions – it was absolutely fine, or even good. But not so good for the more nervous. Over the last year this street (and Platolaan – the eastern end of this same street) have been redesigned. The cycle lanes have gone, replaced with a fietsstraat (bicycle street) arrangement. Essentially, the whole street now forms a cycle route, upon which motor vehicles can be driven ‘as guests’, in theory (although not necessarily in practice). An important condition for designating a road section as a cycle street is that the bicycle traffic really has to dominate the streetscape. Although little experience has been gained with cycle streets, the dominant position of bicycle traffic appears to be sufficiently evident when there are twice as many cyclists as motorists on a road section. If this requirement is not met… the road authorities may try to reduce the intensity of motorised traffic to ensure that the intensity ratio is achieved. A large number of cyclists have to be present – not only relatively speaking but also in absolute terms – to qualify the road as a main cycle route. 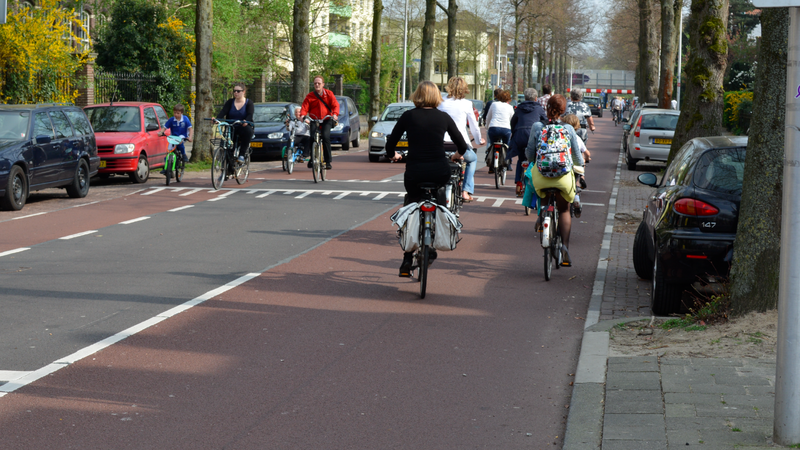 … In order for a road section to qualify as a cycle street, it must carry at least 1,000 cyclists a day. With 14,000 cyclists per day, Prins Hendriklaan quite obviously passes this threshold with ease. I am not aware of the figures for motor traffic along here, but on my visits to the street, motor traffic was clearly greatly outnumbered by cycle traffic. However, an important issue, I think, is whether motor traffic is low enough along this street. Even with sky-high cycling intensities like those found here, the CROW manual recommends an absolute upper limit of 2000 PCUs (Passenger Car Units) per day. I suspect this limit might be broken on Prins Hendriklaan. At times, there were plenty of motor vehicles on the street, amongst the people cycling. [Update – the PCU figure has kindly been supplied by Ria Glas – around 2,700-3,300 PCUs per day in 2011. This appears to correspond with the traffic figures supplied for 2012, via bz2 in the comments. This is because, unlike many other fietsstraats I have seen, Prins Hendriklaan does not have any measures to cut out motor traffic travelling along it. It appears to form an access road for quite a large area of side streets. The length of the new fietsstraat, in context. It is possible to drive ‘through’ this fietsstraat. The whole bicycle street is about 1km long, and has no closures at either end, or diversions for motor traffic. This is quite different from those fietsstraats which are access-only for only a relatively small amount of properties. So this kind of treatment is almost certainly not transferrable to Britain. It only ‘works’ because it has an extraordinarily large number of people cycling along this street already – it relies on good conditions elsewhere on the rest of the network, to generate these numbers, and to drown out the motor traffic using the street. Indeed, to that extent, it is disputable how much of an improvement for cycling in Utrecht this kind of arrangement actually amounts to. The new surface is nice and smooth, and the way motor traffic is forced to cycle ‘in’ the cycle lanes seemed to have a distinct calming effect on traffic speeds. 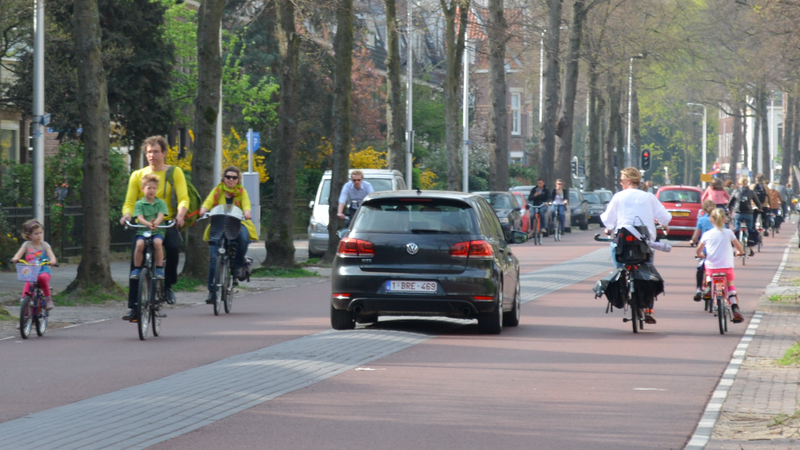 But beyond that, the fundamental issue of interaction with a relatively significant volume of motor traffic (by Dutch standards) has not been addressed. 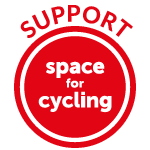 What is absolutely clear is that simply relaying a street in red tarmac, and putting up signs, on a route carrying thousands of motor vehicles a day will not make a jot of difference to the quality of the cycling environment, when cycling levels are low, as they are in most places in Britain. The street will remain hostile and unattractive to the vast majority of people. Prins Hendriklaan cannot simply be transferred to Britain. This entry was posted in Fietsstraat, Infrastructure, Subjective safety, Sustainable Safety, The Netherlands. Bookmark the permalink. If the street reaches 2000 PCUs, then, based on my limited understanding of Dutch transportation policy, a new route for the drivers will be created. I am going to argue that this street can be transferred to Britain (and by extension the other English-speaking countries with low cycling numbers, including Australia and the United States) by transferring the drivers to a different route. An example: In Chicago, there are five east-west streets between the Central Business District and the lakefront highway (Lake Shore Drive) in a one mile north-south stretch. Each has the capacity for 30-40,000 cars (so 150,000-200,000 cars) yet is over capacity. A separated cycle path runs adjacent to the lakefront highway and cyclists use four of the five streets to access it (the fifth doesn’t have access) yet none are optimized for cycling and people cycle on the sidewalk or against traffic. Just to be clear, I’m not ruling out fietsstraats altogether, or stating that they will never work. If, as you suggest, motor traffic is lowered, they are fine, and can form a good environment for cycling. 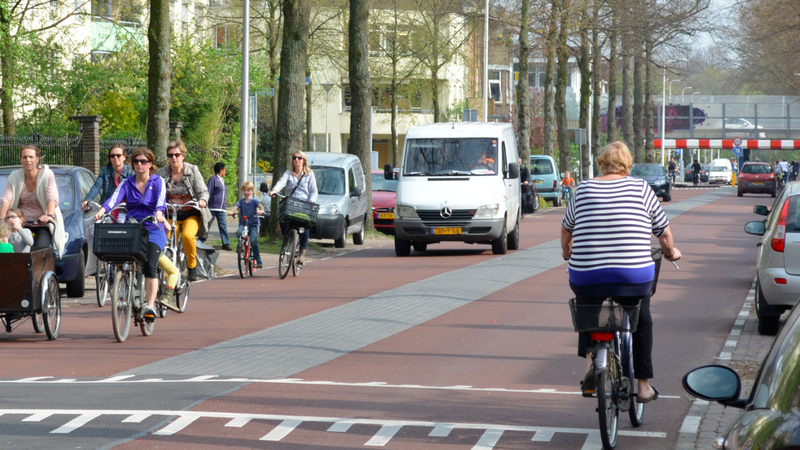 Fietsstraats can and do work – they just need the right levels of motor traffic. It would be good to get the actual PCU levels on this street. From what I saw it must be pretty close to that threshold, or above it – but this is admittedly only guesswork! You were clear, though, in saying that it isn’t “transferable to Britain” because the cycling levels on that street need to already be high. What ways in the Britain road (engineering) manual are available to get cycling levels “that” high? I mean, what kinds of cycle infrastructure is legal for Britain to install on a street, and are any of those types the kind that lead to higher cycling levels? For example, are cycle tracks an option for council planners to install in their district? 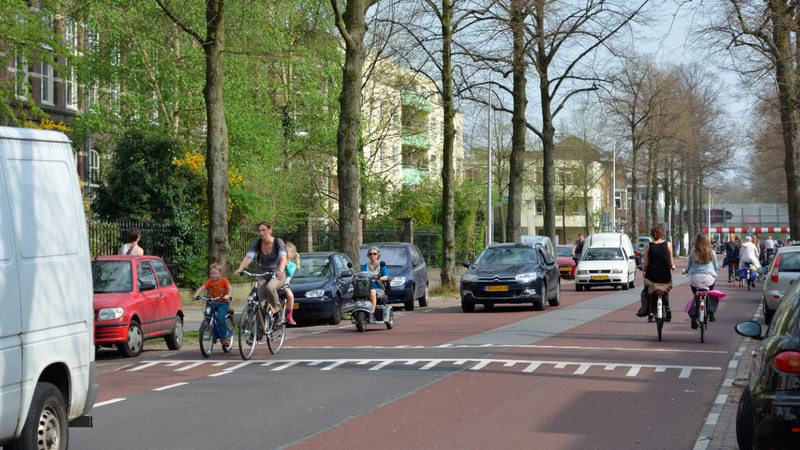 Many streets in the Netherlands are segregated by means other than building cycle-paths. This can be achieved in other countries as well. In the past, Britain has occasionally used bollards to restrict access by cars and this can be enough in many instances to civilize streets. The main things to do to encourage the cycling is to make every home and every place you may want to be after a trip accessible by bicycle, with cycle paths, fietsstraten if on a service streets, wide cycle lanes in some limited cases, and 30 km/h and 60 km/h (the latter used in rural areas) zones. This is priority numero uno. It keeps cyclists objectively safe and also especially subjectively safe. Social safety could be improved a bit using Dutch means for controlling drugs, crime and prostitutes, but it’s a different topic for a different day. Next, oamfietsen should be in every bike store for a reasonable price with all of the “accessories” built in. Panniers and front rack crates are good things to have in stores too because then it makes it feel like it’s easier to shop with. Motor traffic should be diverted around areas where cyclists are likely to feel nervous. Better ring and bypass roads for motor traffic and discouraging through traffic where it doesn’t belong helps a lot. Cutting off routes for rat runners in the 30 km/h zones helps a lot here. Improving the efficiency of cycling is another critical aspect. The diversion of much of the motor traffic on its own improves things quite a lot, to the extent that it is likely that a considerable number of huge multi lane roundabouts and traffic lights can be removed already, and with a minor law change to remove the need for belishas, zig zags and that pedestrians get priority just by looking like they are about to cross, change more to zebras. Making more junctions and the links between them non stop is a huge part of making cycling attractive. These combined should make cycling already very popular even without fietsstraaten. 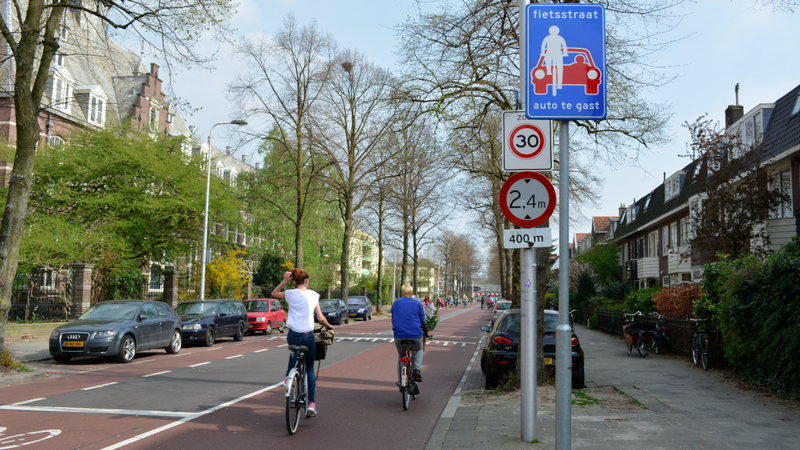 Add those in on streets which meet the Dutch requirements, especially in terms of motor speed, volume and how many more cyclists there are than motor vehicles, would make bicycle streets attractive. About 1000 vehicles per direction per day, it seems. Another point of detail, those speed humps look like the proper smooth sinusoidal ones the Dutch use. They have almost no effect at all at cycling speeds, but the drivers of cars who try to go faster over them will find them motion most uncomfortable. They work more by affecting human comfort (like a hump-back bridge does) than by imparting heavy impact forces to the car suspension. just stick some bollards across it halfway along so that it is no longer a through road. Then it becomes purely ‘access only’ for motor traffic and the level of motor traffic should reduce to just those requiring access. 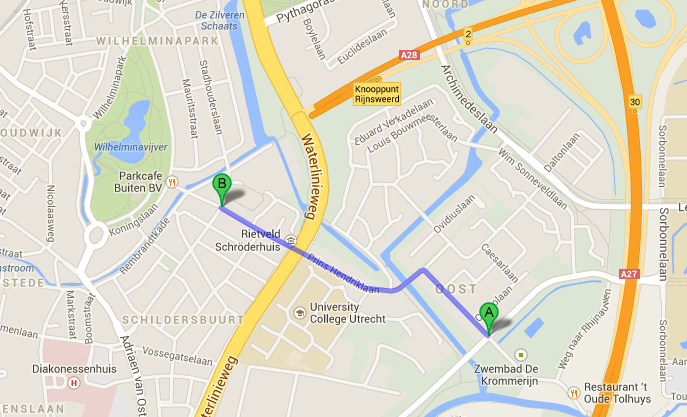 Oh and that University College Utretcht should really have an access road off of Waterlinieweg, whatever that is (appears like a main road) or else a connection to Weg tot de Wetenschap going off Google maps. I’ve just noticed on street view that it is ‘fietsers only’ under Waterlinieweg… there shouldn’t be any through traffic anyway. Exactly my thoughts – 3 carefully-placed bollards would dramatically change the situation. On a more general point I’d agree with David – just because you can find it in the Netherlands doesn’t mean it’s best practice there or anywhere else. 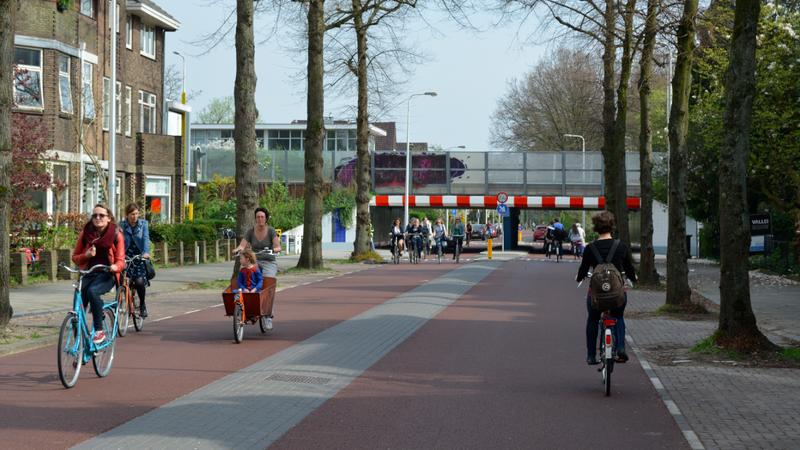 Much of the Dutch infrastructure is 2nd generation (or later) with improvements being made when necessary, and this sort of arrangement is likely to be changed for something better in the future. It’s the attitude of things being ‘finished’ which is a problem. I made comments to Mark about this on twitter. Such arrangements, with lots of through traffic, not only would not transfer to other countries, but they don’t really work very well in the Netherlands either. Successful bicycle roads exclude through traffic and are used for access only. Cyclists shouldn’t be used as rolling speed bumps in any country. That includes the Netherlands. Those places where cyclists have been used as such do not have good safety records. I’ve been pointing out for some time that just because it’s possible to find an example of something in the Netherlands you shouldn’t automatically think it’s something to copy elsewhere. However, you also shouldn’t think that the presence of something here necessarily means that it works well here either. The problem with allowing British transport engineers to mess around with Dutch designs is that they will inevitably screw it up and make it totally car centric as usual. Quite frankly I wouldn’t trust them to build a Lego tower let alone anything with the potential to kill. Far better to just force them to stick to Dutch standards without deviation. They’re not used to thinking outside of their own metal boxes. Unfortunately, for them to use Dutch standards without deviation requires changes to a lot of our traffic laws that define features such as Zebra Crossings etc. Parking would be a heck of a lot clearer (and a lot less yellow and red paint) if we changed our laws so that parking was expressly forbidden except in designated parking bays. Over on the other side of the channel, their laws go on the principle that if it isn’t expressly permitted, then you can’t do it. How about hiring the company that a reputable engineering company that does most of it’s work designing and organizing the construction of cycle infrastructure in the Netherlands, give them copies of what the British regulations in the area they are dealing with, and tell them to design as closely to what they would build for a city like Assen, using the design guidance and best practices from Assen, a flipped (driving on the left side of the road rather than the right side) version that would be UK legal, but resembles Assen or other Dutch cities’ as closely as possible. The bicycle boulevard or neighborhood greenways in Berkeley, Calfornia, Eugene and Portland Oregon, USA, are in my opinion good examples of through routes for bicyclists which motor vehicles may use only for local access, due to the sue of barriers, diverters and false one-way streets (two-way, but motor-vehicle access allowed from only one end of a block). Berkeley examples: http://john-s-allen.com/galleries/berkeley/index.html. But such streets must be carefully chosen and configured so that access is still possible, and fast for emergency services. When paulc says “just stick some bollards across it halfway along so that it is no longer a through road. Then it becomes purely ‘access only’ for motor traffic and the level of motor traffic should reduce to just those requiring access” he hasn’t addressed these issues. I would change those roads you mentioned in a couple key ways. The road surface itself should look like a cycling path that motor vehicles can just happen to access as guests. 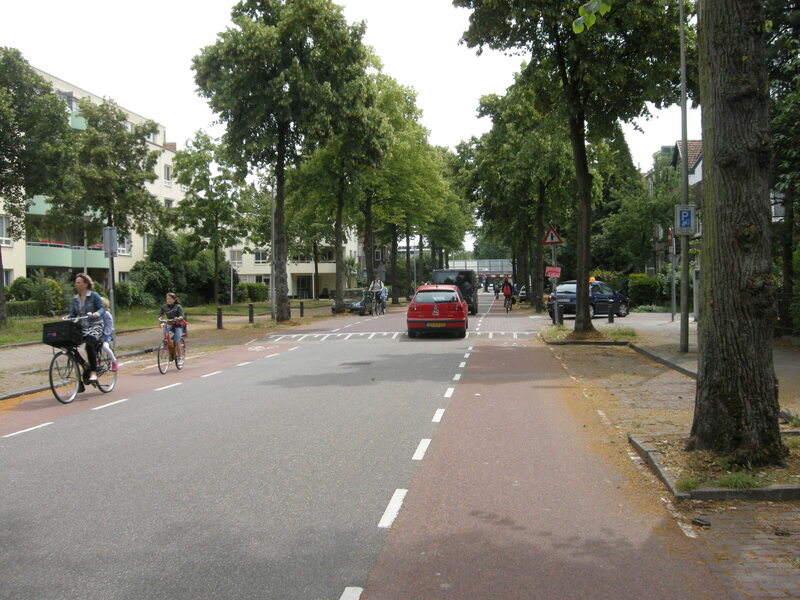 That is one of the primary reasons fietsstraaten are usually designed with red asphalt as the surface. Crossing arterial roads needs some reworking. A maximum of 10 seconds waiting time, can be as low as 4 seconds (3 second yellow, 1 second all red) would help.If you think that is going to make motor traffic flow really badly, then know that at some point that red light is going to hit some driver and it doesn’t do any good to make cyclists wait longer than the have to. Obviously emergency vehicles are excepted and get preemption. And finally, the stop signs on bicycle boulevards, even when rotated to give the bike boulevard priority, still means that if a cyclist is coming from the minor road, they have to stop, as opposed to using their energy more efficiently and only yielding. Idaho has a law to help with this, but even car drivers apparently assign priority better if they face yield signs and a raised table as opposed to a stop sign. And all way stop signs make the bike boulevard traffic stop as well, neighbourhood traffic circles are a better solution here. Sorry about the typos. No way to edit!